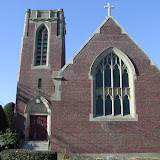 The first Lutheran missionary work in Waltham was begun in September of 1888 by Pastor C. F. Johanson from Boston. Meetings were held in a home on River street and later when numbers were too great the group met at old Christ Episcopal Church on Central St. In November of 1889 the Swedish Evangelical Lutheran Bethlehem Church was organized. In 1891 the congregation erected a church on River street. In January of 1927 a corner stone was laid on the new(and current) church building on Eddy St and Main, the first service was held in the new building in October. Early in the last century the congregation changed their name to First Evangelical Lutheran church but evidence of the previous name is seen in the subject of the stained glass window over the altar (which is of the nativity). In time the building would include beautiful stained glass windows, offices, fellowship space, nursery, and in 2004 a new handicap accessible entrance to the building. Rev Thomas Maehl is the 14th pastor at First Lutheran and began his ministry at the church in 1999. Brief histories usually emphasize the building more than anything else. It certainly is the people of God who began the congregation and the continuing members who constitute the church, not the building. First Evangelical Lutheran Church continues to strive to do God’s work in this Waltham community.